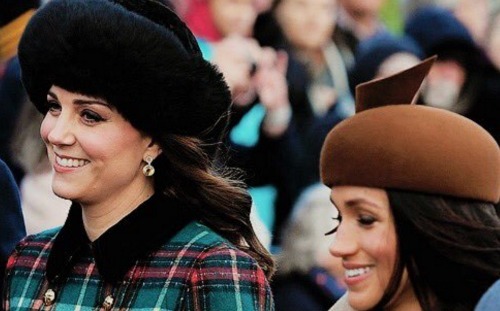 Queen Elizabeth likes to treat Kate Middleton as an equal, while she sees Meghan Markle as a “giggling grandchild.” At least, that’s what a new report by a body language expert claims. The leader of the Monarchy thinks that the Duchess of Cambridge is an equal, mostly because she knows that she, too, will be Queen of England one day while she looks down at the Duchess of Sussex more as a child. According to Express.co.uk, body language guru Judi James thinks that Queen Elizabeth doesn’t treat Meghan Markle as seriously as she does Kate Middleton. That’s because the Queen takes a role-sharing approach during her public appearances with Prince William’s wife. But with Meghan, it’s different. She sees her as someone who is still learning the ropes, but that’s not such a bad thing. The Duchess of Sussex has made it pretty clear since marrying Prince Harry that she doesn’t want to waste any time and is eager to learn as much as possible. With that being said, a lot of royal observers can’t help but wonder why Queen Elizabeth chose to have a solo outing with Meghan Markle only a month after she married Prince Harry back in June 2018. In comparison, it took Kate Middleton almost eight years to have her very own solo outing with the Queen of England. It might take years before the Queen and Meghan develop the same kind of relationship and mutual understanding that she shares with Kate Middleton. Within time, things might change. So far Buckingham Palace has not made any comments about the report. In the meantime, don’t forget to check back with CDL for all the latest news and updates on Kate Middleton, Meghan Markle and the rest of the royal family right here. Does Queen Elizabeth Already Favor Meghan Markle Over Kate Middleton?